Selecting the right vendor from the 20 registered internet service providers who offer business-class connectivity in Bethesda, Maryland is likely to play a significant part in your employee and customer experience. Connectivity isn’t “just” internet. Businesses in Bethesda, Maryland and the greater Washington, DC Metro area rely on fiber-optic business internet connectivity to power cloud-based apps, wifi access for BYOD devices and other productivity tools. If speed or bandwidth slows to a halt or connectivity goes away, your entire organization’s ability to communicate and collaborate can also disappear. In fact, researchers estimate that a single hour of technical downtime costs 98% of businesses at least $100,000. Your organization has the ability to choose between nationwide telecommunications firms and smaller, locally-based vendors to power the next generation of your businesses’ communications. However, size doesn’t matter as much as your vendor’s commitment to delivering a valuable experience does. While evaluating any vendor’s reputation and customer review’s carefully is important, size is not nearly the most important factor to take into account when sorting through options. In this blog post, we’ll guide you through how to understand your Bethesda-based businesses’ internet connectivity needs, and provide unbiased insight into several of the best ISPs who offer enterprise and business-class connectivity. What Kind of Bethesda, MD Internet Service Do You Need? The most effective way to begin narrowing down your options is to begin evaluating your needs. While there are thousands of registered ISPs in the US and dozens in the U.S., not all internet service packages are created anywhere close to equal. One vendor’s “business internet” can be very different than another. Unless you understand your own needs, it’s not necessarily an effective exercise to try and compare packages based on price alone. Which Type of Internet Technology Do You Need? Your business wants high-speed internet, but what type? Organizations in Bethesda have the advantage of fiber internet access. However, before you make the decision to focus on fiber instead of copper or coax, check your proximity to fiber internet. Learn more about your options in Fiber, Cable or DSL: Which Type of High-Speed Internet is Best for Your Business? Do You Need Enterprise-Class or Business-Class Service? The size of your organization can impact the level of service you need, but that’s not the only variable. Enterprise-class internet connectivity solutions offer superior interoperability with complex technological infrastructures. They also offer stronger service-level agreements. Your organization may lack extensive in-house IT talent or the ability to estimate your bandwidth needs accurately before you start talking to vendors. That’s okay. Chances are, you can still begin gathering requirements. How many employees do you have? Do they work remotely? Do they tend to upload video, video conference, or do other activities which require heavy data? Is your business telephone service riding over your connection, too? Evaluate your needs more closely in How Much Bandwidth Do I Need for My Business? Does your organization use technologies which can impact your requirements around speed and bandwidth? Examples of technologies which can heighten demands include streaming, file sharing, IoT, business phone service, and video conferencing. More insights in Can Your Infrastructure Handle Emerging Bandwidth-Taxing Technologies? Once you’ve understood how your employees, their habits, and other variables such as your industry may impact your requirements, the following steps are a high-level overview of how to ensure your experience is positive from end-to-end. To learn more about how to evaluate ISPs for quality and service, check out 7 Things Companies Require from Their Business Internet Access Providers. Businesses located in Bethesda, MD have a major advantage over many of their peers located in other major metro areas nationwide--near-guaranteed access to fast, reliable, and scalable fiber-optic internet connectivity. Since 2008, Bethesda has had fiber resources, which have expanded significantly since. While the following resources are not a comprehensive list of connectivity options for organizations in the area, they represent a few vendors to consider for your connectivity needs. 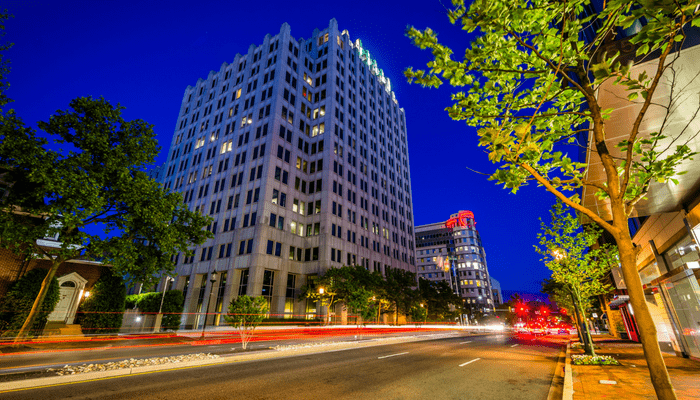 Founded in Maryland in 1995, Atlantech Online was one of the first providers of fiber-optic internet connectivity in Bethesda, Maryland and an early champion of business communications technology in the greater Washington, DC Metro area. While connectivity has evolved significantly since the mid-90’s, our values haven’t changed. We still believe that internet service should provide our clients with guaranteed quality, flexibility, and security. To learn how Atlantech Online helped Montgomery College become a next-generation connected campus, download the case study. With speed options ranging from 5 Mbps to 100 Gbps, Atlantech offers affordable, fast, and flexible fiber to businesses in Bethesda. Our local expert service technicians can deliver high-quality connectivity to most commercial addresses within 30 days of an order. At Atlantech, we’re specialists in meeting the unique needs of Bethesda businesses in many different industries, including complex implementations in demanding industries. Once we bring our clients online, they know they can trust Atlantech to provide live, expert customer support 24/7 with network monitoring, a live receptionist, and domestic customer support. Click here to check your proximity to Atlantech's Bethesda fiber resources! One of the largest telecommunications firms available worldwide, Verizon offers both high-speed internet and some fiber coverage in Bethesda via Verizon Fios, Verizon's nationwide fiber-optic network. Verizon offers standardized service packages to prospective customers with estimated pricing, along with guidelines to help businesses select internet connectivity. While the service packages do offer price lock-in, customers are encouraged to explore whether average speeds are similar to advertised speeds. Bundling discounts are available to customers who combine internet with voice and television service. Verizon also offers enterprise-class solutions, which are available as customized solutions by quote. Comcast's website reports their nationwide fiber network is currently available in 39 US states and 29 metro areas, including Washington, DC. Prospective customers are encouraged to check availability in Bethesda, though availability for tested addresses was limited to high-speed cable internet at the time of writing. Additional city-wide networks are being rolled out by the provider on an ongoing basis. Comcast also offers enterprise-class solutions, which are available as customized offerings. Based in Princeton, New Jersey RCN Business is a facilities-based provider of high-speed internet and voice services which provides both business-class and enterprise-class service to organizations in Bethesda, Maryland. RCN does have fiber-optic connectivity service in Bethesda and other locations nationwide. In addition to connectivity and communications, RCN Business offers an extensive menu of Unified Communication and business technology support services to organizations, including managed security and fully-managed services. Founded in 1996, Megapath is a Pleasanton, California-headquartered organizations which offer telecommunications services to businesses of all sizes at various locations throughout the United States, including Bethesda, Maryland. MegaPath offers both business-class and enterprise-class connectivity, with an emphasis on flexibility in customized solutions. Per their content, their options include Ethernet, T1, fiber, cable, wireless, and DSL Internet options and speeds up to 10 Gbps. Prospective customers are instructed to check proximity to their fiber resources. If you were hoping for reviews that pointed to one internet service provider in Bethesda which is the best, you may be disappointed. We’re biased, but we also believe there is no single-best provider for every business in Bethesda, Maryland. The best Internet Service Provider in Bethesda, Maryland depends on your needs. However, with an understanding of your requirements and what shapes an exceptional client experience, you can approach the vendor evaluation process armed with knowledge. Ready to take steps towards reliable, fast enterprise Internet service? Click here to request a quote from Atlantech Online!